Since I was out of the state chasing mule deer in Idaho’s Selway Bitteroot wilderness with my dad in early November, I needed to make up the on-hill ski patrol refresher in early December. 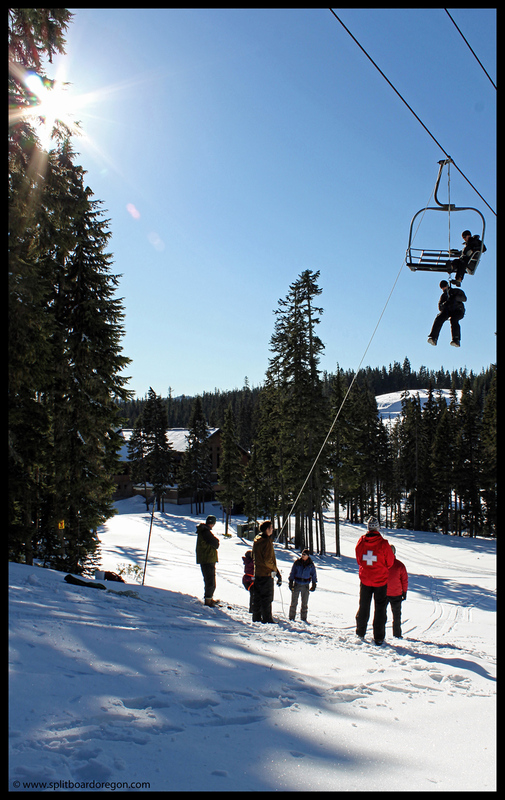 One of the funner activities of the on-hill refresher is chairlift evacuation practice. 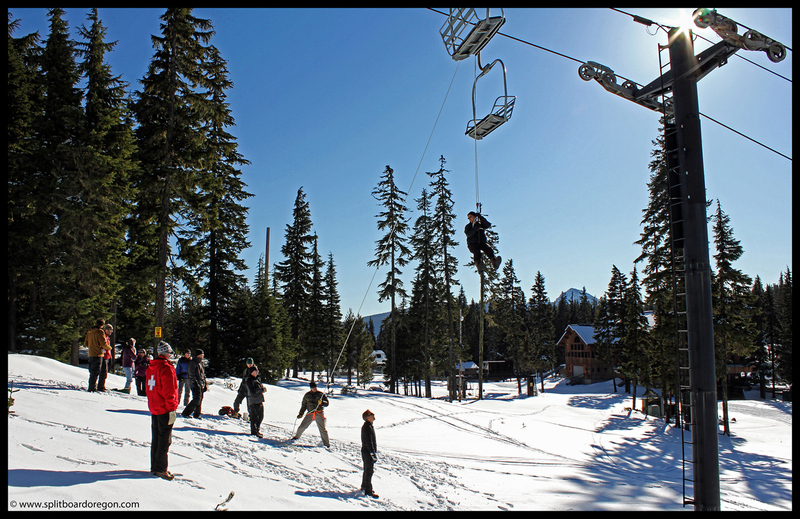 In the event of a lift failure, patrollers are responsible for getting guests removed from the chairs using a system of ropes and pulleys. Those of us who needed to make up the on hill refresher and this years ski patrol candidates met at the Pass at 8am, where about 15 inches of snow covered the ground. The weather was beautiful, and the mountain looked to be in decent shape for riding given the minimal coverage, though on-hill operations hadn’t started yet. 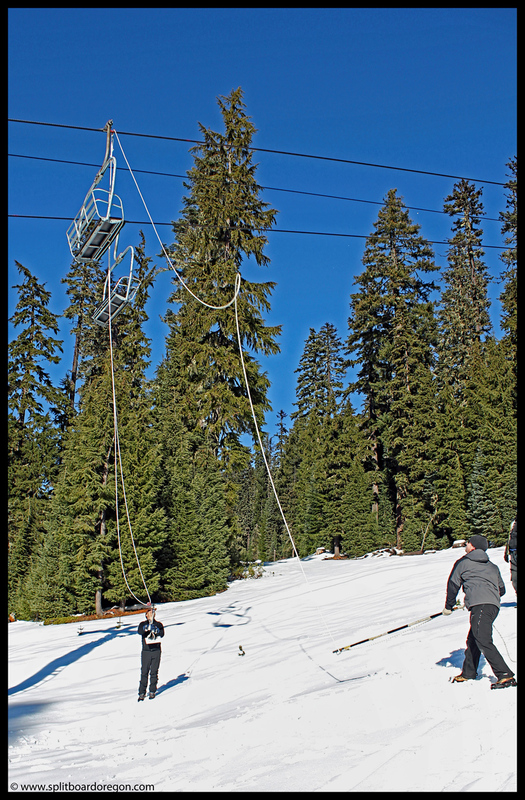 After a brief review of the lift evacuation plan and some practice belaying, we headed out to the Twilight lift to practice. Several of us loaded the chair and after we had been shuttled uphill a couple hundred feet, the lift was shut down and locked out. A few of us who were qualified self-evacuated from the chair using an SMC Escape 8 and 5-6mm accessory cord to rappel. Next, the large static rope is placed over the chair haul line and lowered to the ground. 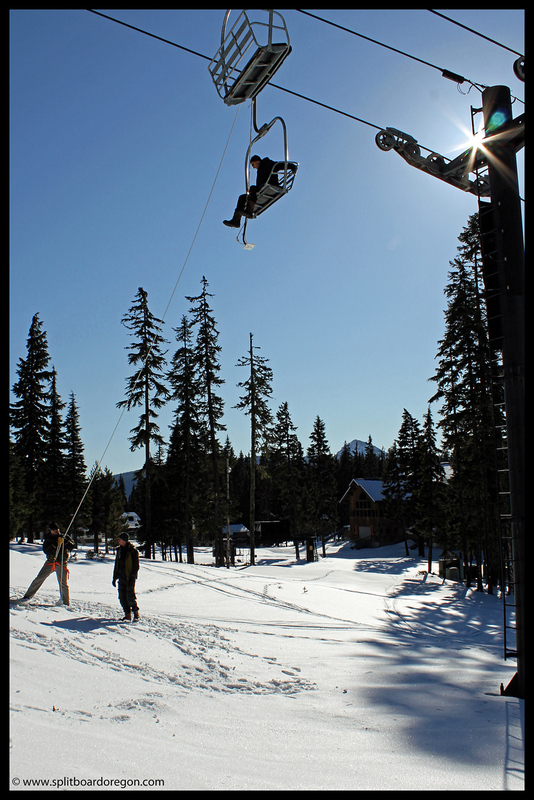 One patroller who is the belayer, belays the evacuation tee up to the chair, while another patroller talks to the person on the lift. 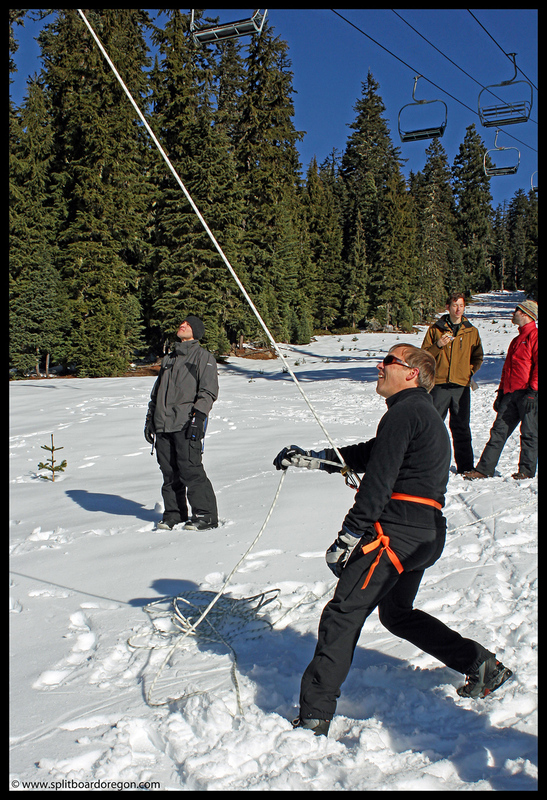 The person on the lift hops on the evacuation tee and is lowered to the ground by the belayer. After everyone on a chair has been lowered, the rope needs to be flipped over the chair and moved down the haul line to the next chair in line. This is accomplished by throwing the rope over the chair using a long piece of bamboo with a carabiner attached to the end. The rope is threaded through the end, and with one smooth throwing motion, tossed off the haul line. The process is repeated to throw the rope over the haul line. Then, the entire process is repeated at the next chair down. Instead of using actual climbing harness for belaying, a harness is improvised using a locking carabiner and 1-inch tubular webbing, which allows for any patroller to use it in the event of an emergency. Lowering people from the chair using the rope and evacuation tee’s isn’t the most time efficient process, but gets the job done and would definitely work in an emergency, especially with properly trained people working in teams and using multiple ropes. Fortunately, lift failure doesn’t occur all that often, so the chances of having to evacuate a lift for real are slim, but it’s nice to know it can be done easily with the proper training.